Let's start with a simple example session with one short mono audio signal ("Lead vox") shown below and create a Stereo Double of that audio. However, the techniques to be described will also work for larger sections or even an entire track. Note that in the Revoice Pro Session shown, the second track has already been labelled Output 1, (which will be the destination for the Doubler's output); the track containing the Input audio is labelled Audio 1. In the picture, the input audio is shown as "selected" (in green), which is how it would be immediately after loading it. The New Process window is shown open at the right. If you do not see the New Process window (shown in the image above on the right), then you need to open it. There are two ways to do this. 1) RIGHT CLICK in any Process Control Track and select New Doubler. 2) Make sure the Revoice Pro session window is selected and press the B key on your keyboard. This will open the New Process window as shown above. LEFT CLICK the Selected Process drop down to select Doubler. Pressing the B key again will close the window - but it is generally more efficient to leave this window open. Revoice Pro automatically preselects all of the drop down menu items in the New Process window. We briefly explain each drop down option used in this first example, in which none of these settings will need changing. Selected Process: is correctly set to be a Doubler process. (It will be what was previously selected until you change it). 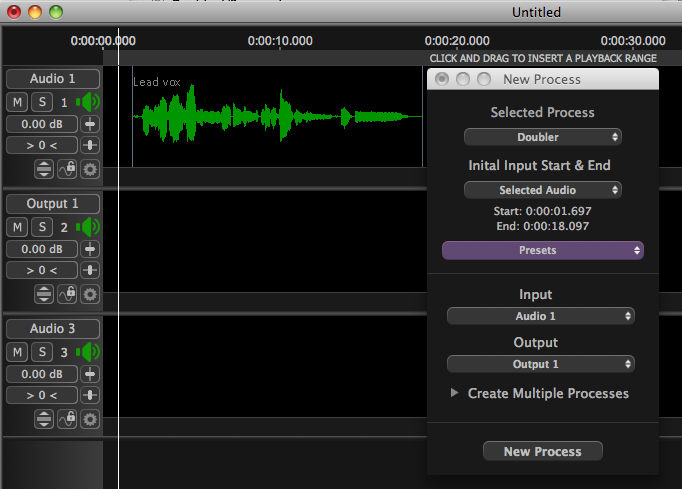 Initial Input Start and End: the New Process window has correctly chosen the Selected Audio (which is the audio shown in green) from start to end. Alternative options for setting this can be found in Setting a Process Control Block. Inputs: the Input is currently set to the track Audio 1, into which the source audio has been loaded. Create Multiple Processes: it is possible to create multiple output tracks using this option. Output signals and processes will be automatically labelled with a unique sequential number for easy identification (for example Dblr:Lead vox, Dblr:Lead vox(2), ... Dblr:Lead vox(n)). IMPORTANT NOTE: All doubler outputs created from Multiple Processes will initially have the same settings and will sound the same. If you want to hear different treatments, after multiple doublers have been created, open the Process Control Panel for each of those doubler outputs and change the parameters to a different setting from the other doubler outputs.